FlossieBlossoms: I WON a doll quilt! I don't win a lot of stuff, probably because if I see a giveaway that already has 400 people signed up, I don't bother, but sometimes I just have to join in! I got really lucky and won this little beauty, made by Carol, mamacjt, from Flickr. I am so tickled with it, it's just perfect and so cheery. I hung it in the stairwell going up to the craft room. Be sure to go to Carol's blog, she has so much talent and such a great sense of humor, it really shines thru in everything she makes. She is the resident Angel Mama for several swaps, which means she makes quilts and pincushions and all kinds of things to send to people who didn't get what they were supposed to get because their partner "flaked" on them and reneged on the deal. She is priceless and such a dear, kind friend to have and to have a piece of her in my house is a real treat! Thanks so much, Carol! 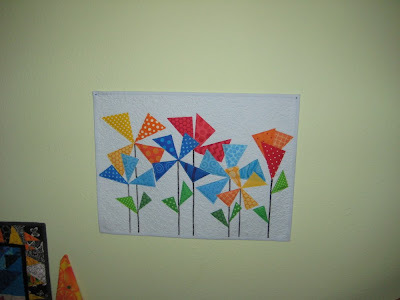 I just love this pinwheel flower quilt, it's incredible! Here it is hanging next to the placemat that I received from Sudi Laura. Looks good, hey? I'm in another mini quilt swap, this month's theme is book-related. I can't reveal much yet, but this is a sneak peek of what I'm making for my partner, Rachel. She just happens to love green and purple. :) I should have it finished by tonight but can't show it to you until she's received it. She's supposed to be making me something from the book "Coraline". I've never actually read that book, but I LOVED the creepy movie! My baby has gotten so big, she doesn't camouflage too well on her quilt anymore! 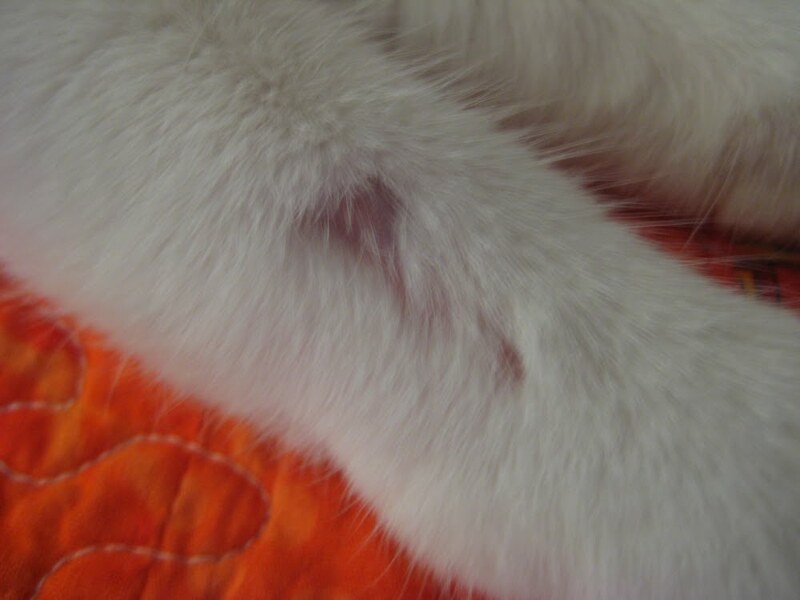 And this is what Nosey Parker's bite looks like now that it's healed. Temporary (we hope) hair loss. She's feeling great, though. The other day I was on the phone and looked out the laundry room window to see her about 10 feet up in the tulip tree. Next time I looked, there was no sign of her in or under the tree, which was good. I didn't think too much about it after that until an hour later when I went upstairs to find her up on the balcony, in 90º heat! Gleeps, she climbed the tulip tree about 20 feet up and crawled over as far as she could and then she must have jumped the rest of the way to the balcony, I'm so glad that I didn't see that! The branches that get close to the balcony are SMALL! Brittle, even. If she had fallen, it's at least 15 feet down to the ground and part of that is concrete driveway under the balcony. OMG. I hope she never does that again! She's such a daredevil. She does NOT get that from me! 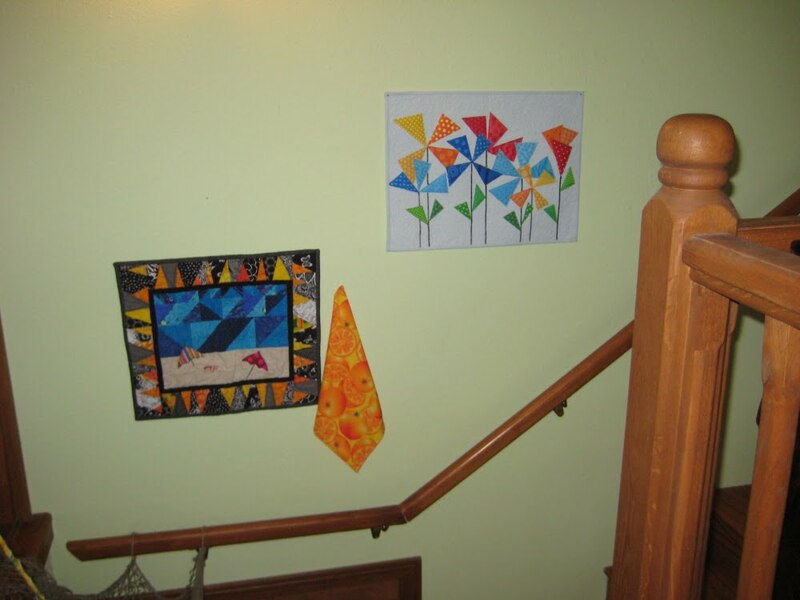 That cute little quilt looks really pretty there in the hallway! I'm so glad you won! No one deserves it more for all you do! 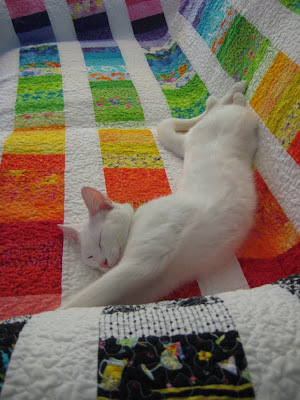 I love the rainbow quilt! It's just perfect with your sweetie napping on it! That is an amazing doll quilt!! Carol is so talented, isn't she? I particularly love the flower on the far right that's still a bud. So clever. congrats on the quilt! It's so fun to win isn't it?! And I adore your kitty. She looks quite content all sprawled on your quilts. My kitty is grey...so I'll have to make a grey quilt for her to blend in to. I swear, the next time I buy furniture it's going to be grey so that you can't see the stray cat hair here or there. I love that little quilt!!! What a wonderful win. That's a beautiful little quilt you've recieved. We too have a dare devil cat that jumped from a tree into our top floor through an open window the other day. My daughter (her owner) couldn't watch. Very sweet kitty. I really love cats! And I just saw your beautiful quilt over at One Flew Over. It is totally exquisite perfection!